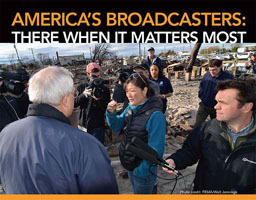 Members of Congress Support Local Broadcasters | Broadcast Public Service: Local Stations. Big Impact. Several members of Congress praised broadcasters in speeches given on the House floor and submitted comments for the record on Feb. 25. The Representatives commended local broadcasters for their charitable work and their vital role as first informers during times of emergency. Click to watch C-SPAN’s video of comments from Rep. Kevin Cramer (ND-At Large), Rep. David Cicilline (RI-1), Rep. Rick Crawford (AR-1), Rep. Ted Poe (TX-2) and Rep. Blake Farenthold (TX-27). Rep. Henry C. "Hank" Johnson, Jr. (GA) submitted comments into the Congressional Record stating, "Every community is impacted by broadcasters, the individuals who have dedicated their lives to disseminating important information by radio and television." In other comments submitted into the Congressional Record, Rep. Doris Matsui (D-CA) said, "Broadcasters play an important role in our country. I want to applaud the work of broadcasters, particularly those in Sacramento, for working diligently to cover and provide local news programing to our communities, and for being strong community partners."